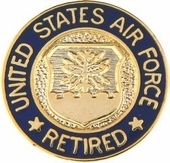 This U.S. Air Force (USAF) Reitrement Pin is the official pin for Air Force veterans that retired from service in the United States Air Force. The pin is 5/8"" in diameter. The center of the pin is gold with the U.S. Air Force Shield in front of crossed arrows. The circular outer border is blue with two gold stars and gold lettering that reads United States Air Force Retired.